Do you remember back in 2007, when Richard Branson announced a global competition for the reduction of greenhouse gases in the Earth's atmosphere? 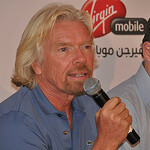 Branson's Virgin Earth Challenge competition will award $25 million to whomever conceives and develops a "commercially viable design which results in the net removal of anthropogenic, atmospheric greenhouse gases so as to contribute materially to the stability of the Earth's climate system." Is that all? The competition is no longer accepting applications for this Herculean task, and earlier this year Virgin announced a short list of 11 companies that have made the cut, six of which are from the United States. The six U.S. companies that are working their brains off trying to scrub the atmosphere clean of greenhouse gasses are: Biochar Solutions, Coaway, Full Circle Biochar, Global Thermostat, Kilimanjaro Energy, and Savory Institute. Science can sometimes make my brain hurt, so explaining the science of the technologies these companies are using will not be done adequately here. Biochar puts it simply by saying that they are attempting to convert carbon liabilities to carbon solutions. With the contest well into its fifth year, everyone has got to be wondering if a winner will ever be announced. According to Branson, the answer to that question is maybe, maybe not. First, the companies must impress the six judges, including Branson, Al Gore, and four super-smart scientists. Once they get past the judges, they chosen ones must contend with a mélange of government and bureaucratic issues. Governments don't exactly have a reputation of fast-tracking anything. It's not a stereotype, it's just the truth. Anyone who has ever been to the DMV knows that. Finally, it's hard to imagine the production and implementation costs of such technology. I'm no rocket scientist, but I think it's safe to assume that these costs will be well over the $25 million prize money. As exciting as the concept of developing a commercially viable CO2 filter for the planet is, Branson has stated that we all have to accept the possibility that no one will win the contest. We would all like to believe that all the world's inhabitants would behave in an eco-friendly manner out of a deep abiding love for the planet. Since this isn't the case, money helps to motivate, and a potential $25 million payout definitely works to move things along.